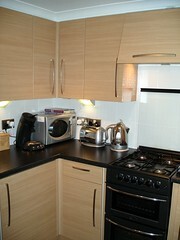 ...finally, our kitchen is finished!!! 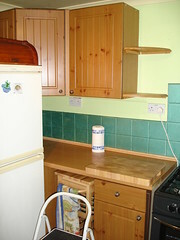 We've pulled our finger out and done the last coat of paint and couple of jobs to get the kitchen finished. Hurrah! It has been a long journey since we placed the order at Wickes on the 1st Oct 05, but we've come through it all, with some help from a few friends, and the kitchen now looks amazing, we're really happy with it. Update: I've just worked out how much the kitchen cost (inc cabinets, floor, tiles and all the odd bits and bobs for decorating) for all you stat fans! It came to £2220.24 - not bad really for what we've got. Bonza. Permanent link for "135 days"